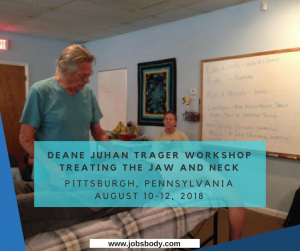 Deane Juhan has CANCELLED the August 10-12, 2018 workshop at Pittsburgh School of Massage Therapy in Pittsburgh, Pennsylvania. The workshop is for Trager Fundamentals and Resistance and Release Work and focuses on Treating the Jaw and Neck. Deane Juhan will also give a slide/lecture about Gamma Motor System: The Key to Motor Learning and Habit Formation. Resistance and Release work is an innovative approach developed by Deane Juhan, based in large measure upon the rehabilitative techniques of Dr. Milton Trager. Resistance and Release work result in dramatically improved muscular coordination, adding both ease and strength to all of our activities.